I just had to tell you how amazing I think you are, and how much you've helped me on Sunday - I have a better outlook and really feel like you helped me connect with my husband and that he really did 'talk' to me which comforted me more than you'll ever know. I'm sorry I went over the hour a little but what you gave me was the best gift I could've had. Also I want you to know that he was a wonderful and unique selfless man who touched so many lives in a positive way, and who I'll always deeply love and be grateful he was in my life and blessed me with my 3 beautiful children. You have a special gift and you are a beautiful person - I am very spiritual and you made me really feel less alone, and hopeful. I hope you had a fabulous birthday - until next time - thanks for everything. Needless to say back in October, on the 12th , I met “Michael!” This is the name. And from the experiences we have had from first meeting and looking into each others eyes, our time spent talking and the feelings we have felt over the last two and half months have been uncanny, unexplainable and unique beyond words............ This is truly a heaven sent gift we were both given. I was telling him just two weeks ago about you and mentioning his name about a year ago for the first time and then other specific things and he was intrigued. He asked me if I mentioned it to you and I said no but I had to tell you !!!!! He asked a few questions and then said , I have never been but would like to go see her. Hope all is well and we’ll chat soon! I wanted to share with you that I got the lead part in my film class for a movie we will be shooting to submit to film festivals! You said in 3 years near thanksgiving and we are filming before thanksgiving! I came to you 1 month ago with my daughter. I just want to say hello to you, and you are THE BEST PSYCHIC ever .. Everything that you said to me is coming true .. I will see you again. All my regards, Alma ( hugs from me ) have a wonderful day . Our session with you on Saturday was amazing. It was emotionally draining and yet fulfilling at the same time. We covered so many issues and yet never strayed from focusing on the only reason we were there, to connect with someone we will never let go of. You are the most compassionate medium I have ever sat with, and I found that so comforting. I will, and have already recommended you to anyone who wishes a true spiritually fulfilling experience in a serene and comforting environment. Thank you so much. It was our pleasure to meet you and hope to meet with you again. We enjoyed having you both as our Halloween Party entertainment. Our guests truly enjoyed their readings with both yourself and Vinay. They were shocked at the accuracy of the readings. In one particularly ironic/funny moment you told one of our guests during her reading that “it would take a bomb going off to get your boyfriend to commit to you.” The irony is that her boyfriend works as an explosives expert for the U.S. Gov’t! How could you possibly have known that? Other guests were deeply moved by their readings and have opted not to share them. You were both pleasant and professional and we look forward to seeing you again soon. Thanks for a wonderful evening. I was there (for a reading) Sat with my girlfriend. I just wanted to tell you WOW thank you so much for that amazing reading. Having my sister come to me brought such joy to me and my family especially my brotherinlaw's joy, he cried and I think he was relieved knowing my sister was not angry. He misses her so bad maybe he can come to you as i did and feel that remarkable connection that I received from her. I can't get that day out of my mind to get to connect with my dad mom gram and sister was one of the best days of my life:) You are absolutely AMAZING and gifted. Thank you again for sharing your gift with me. I first met June Ann almost a year ago. As I waited for my appointed time, a feeling of anticipation mixed with skepticism came over me. Was this medium for real? Would she be able to communicate with those that have passed? After a few moments of preparation, June looked up at me and said "Your husband passed over recently didn't he!" (It was NOT a question!) THAT simple declaration got my attention!! I hadn't told anyone of Don's passing! June had no way of knowing this ahead of time...I agreed yes, my life-partner had in fact passed around a month and a half prior. She went on to tell me "he's here, with us - now"! She describe Don in detail, telling me she saw him patting me on the head - something he had done on a regular basis! June told me many things that afternoon - each one another confirmation that she was indeed communicating with Don - as she described objects, and related incidents about Don and I that she would have no way of knowing. I have been back to see June several times, and every session has been successful! Many of the people in my life have been able to come through with June's help. I have had contact with my mom, my grandmother, and even a few others that I did not have the pleasure of knowing in this earthly realm. If you are looking for "the real deal", someone who is truly gifted, talk with June. June was the first psychic I had ever seen. I admit - I was skeptical - but June changed my mind forever! I have had 3 readings with June. She has been so intuitive and accurate on all of my readings-I am so grateful. I am so at ease with her, and I trust her completely. She is very professional and amazing at what she does. I often tell others that it is as if i am speaking with my mom or another trusted family member. I am going through a divorce and a very tough time in my life. I asked June for guidance and some support from a family member on the other side. What she told me was right on and transpired. June gives me hope when I am empty and strength when I feel like i can't go on. I was in a few weeks ago for a reading and wanted to send a thank you note. I know you probably don't remember now but I was the one that you told might have some psychic abilities and referred me to ISD. I really wanted to thank you for the reading; it was centered on a relationship, a new man in my life who was going through a lot. There were a few things you had mentioned at the time that I was not aware of. I have been seeing him again and he provided some information in which proved you right. I know this sounds vague but just wanted you to know you were very accurate. I have to tell you , it was a couple weeks I think before x-mas that I saw you last..... Not sure if you remember we were chatting about the online dating stuff. You had recommended a couple I did end up logging into that I hadn’t tried.... I had a nice chat with someone from one of those sites.... I had gone out for coffee with another and so on..... and you had done a little meditation time you said before I came for my apointment and came up with names of men.... and if they rung a bell.... no, they didn’t at the time but *these* men all had the names you gave me! And after the fact is when realized it! I got quite a chuckle! June's intuitive skills were inherited from generations of female family members. 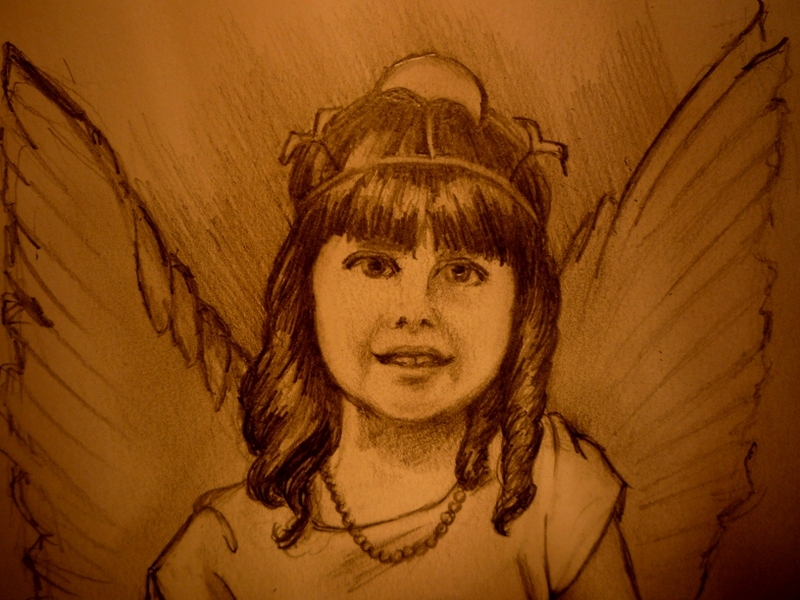 Gracie, the child angel in the drawing, was June's mother. Gracie died at the age of 34, when June was 7 years old. DISCLAIMER: June Ann's services are for entertainment purposes only. All users must be 18 years of age or older. Online Dating Service - SocialGrid transforms the Internet into a free online dating service and social networking community.